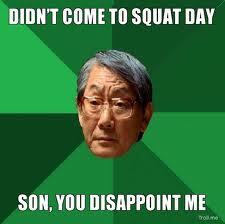 LAST DAY OF 20 rep squats!!! CONGRATULATIONS! 9 am and 11 am classes are canceled this Saturday! Come out and cheer on Swamp Rabbit CrossFit’s Greenville Games competitors at the Piedmont Athletic Complex! Wear your SRCF gear! Check the spreadsheet to see what time to watch competitors. GG Competitors! Greenville Games does not count as a firebreather WOD. Gotta stick to the rules!